Whether styled together or separately, this set of nesting tables are sure to be a statement piece in your home. With sturdy and stylish hairpin legs, and an elegant Walnut finish, what's not to love. This pair of tables are darling! They went together easily in no time at all. 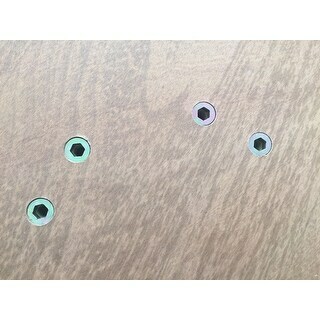 The underside of the tables have counter sunk bolts to attach the legs in with the provided bolts. No need to worry about over tightening or stripping the holes. They even sent me a couple of extra bolts. The tables are sturdy. The smaller one fits half way under the larger one to give it a really neat look. Tops of the tables is a pretty finish in a med dark walnut. The edges have a slight bevel and are finished in the same color as the top, but no wood graining. They look like I spent a lot more on them than I did. Great looking nesting table set. Finish is very nice, 50's - 60's retro vibe goes great with our decor. Assembly is a breeze, and construction is really quite sturdy. Nice design, and a solid overall value at the price! These tables are easy to assemble and sturdy. They are a little lower to the ground then I had envisioned but I also didn't read the measurements. Even still they fit perfectly in our living room and our low couch. They match the 18' Guitar Pick Side Table - Walnut - 18x18x25h we also purchased from Overstock! I love these tables. They're good quality and they look exactly like the photos. They're a great fit for mid century modern homes. They were also really easy to assemble. Goes perfectly with our walnut accents on our furniture! Was looking for a small coffee table for our small living room space, and these are great. Great tables for a small space. The hairpin legs give the tables a light and airy feel, and the color of the top is a nice neutral. Seems pretty well-made. The tables partially nest and can be placed together or used separately. Great coffee table set! So glad they came back in stock and I could get them! Really easy to assemble the hairpin list to the wood top. Doesn't have a cheap look at all. Being able to position the how you need makes them even better. I really enjoy these and think you will too! 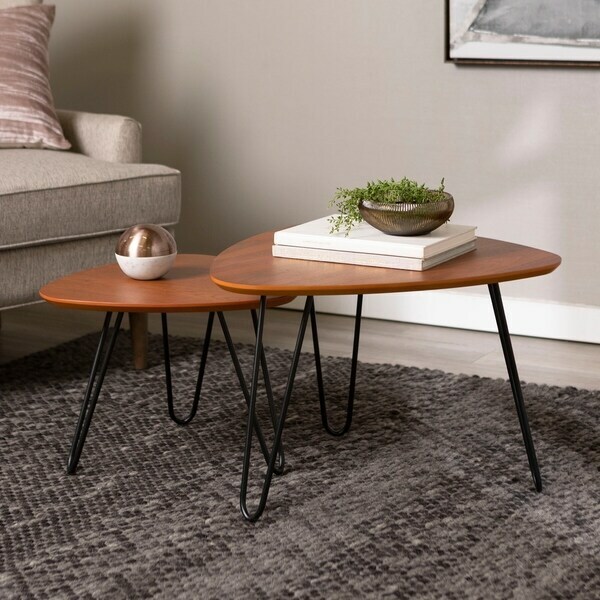 The Carson Hairpin Leg Nesting Coffee Table Set is perfect for a small apartment. It is streamlined and allows for storing the one when not needed and easily pulling it out when you have company and need it to serve appetizers or to set drinks on. It is sturdy and attractive and our tenant is very happy with it. 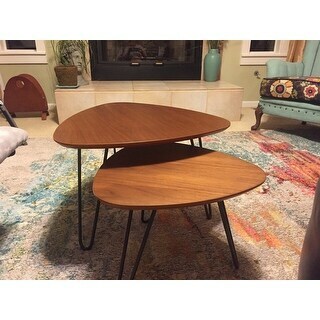 These are super sweet mid century modern nesting tables. Good quality - just be careful when removing them from the box. They scratch easily. Super cute! The tables have a wonderful retro-vibe. Very easy to put together. Just attach the legs and you are ready to go. Love the nesting feature for you can make the smaller table out of site if the floor space is needed. We have an old house that is long and narrow. Big coffee tables and bulky furniture take up too much room. These look great! *French Bulldog not available for purchase on Overstock. These tables are super cute, adding unique shapes to the living room. They also help open up the space as well. Very easy so assemble, didn't use the guide at all. I would recommend these tables to anyone who's looking for unique shapes to add to the space. These are beautifully stained tables, and they are gorgeous! Just what I wanted. They are just the right size to put together, and they are as exactly as described. These tables have a nice finish on the top and their legs, and good construction. Great value for the price point. I love the versatility. They are really great for small spaces. I love the size of this coffee table! It has been the perfect size in my living room! The modern feel, but simplicity of the design is wonderful. It was so easy to put together! Definitely recommend! "what is the weight of these set ?" The combined weight of the set is about 25 lbs. "Do these tables actually nest? Or does the smaller one only fit partly under the larger one? Thanks." The smaller fits half way under the larger one. They look good together though! I choose this product because I was looking for a coffee table that a) maximized space since I live in a small apartment b) matched current decor and furniture. My dinning table has a walnut finish and a lot of my furniture is mid century with some industrial edge c) I liked the triangular look. It made it funky and not cookie cutter like a rectangular coffee table d) price seems to be right on point and a great value for getting essentially two tables. Now let's see if it will be what I am expecting, once it gets here. "Are there end tables that match?" Yes there is an end table to match this coffee table set. The end tables can be found under item# 22281003.